This jumbo set of dice is sure to hit the spot at your picnic or park outing with family and friends. 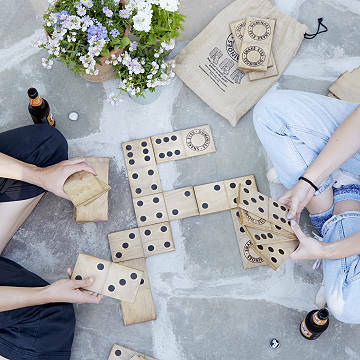 Bring the family together for some larger-than-life competition at the beach, at a picnic, or just at home with these oversized dominoes. Hand made from solid pine wood, each piece is sanded before the pips are hot iron branded into each side. Each set comes in a rustic drawstring bag and includes 28 dominoes, from double blanks to double sixes. Handmade in Minneapolis, MN. Click here for more yard games! Jeremy Exley may be a chemical engineer by degree, but he's always had an entrepreneurial spirit and drive. Now, from his Minneapolis workspace, he makes beautifully crafted wooden yard games that bring people together and get them outside. Wipe clean and dry after use. Store indoors. This is the perfect gift for my daughter's family. They love outdoor games. Using the ability to understand 7 combine spacial relationships with Math ability is a definite hit with our Grandchildren! Very well made, just needs to be BIGGER. This will be used as an entertainment option for the campers in our campground. We think they will really enjoy having this option. Good for either couples or families. Made for a very nice gift! Great gift for the person who has everything and enjoys entertaining out of doors. Awesome fun for the whole family.